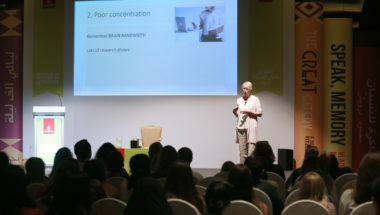 In February and March, I had two trips to Dubai, one to a huge education conference and one to the Emirates Litfest. Both incredibly different experiences in so many ways; both exciting; both life-enhancing for me and I hope both useful for the audiences! Sometimes the highs and lows of any overseas trip are the unexpected ones and that was certainly the case on these. For the conference, the highs were meeting and bonding with three of the other speakers: Michele Borba, author of UnSelfie, and Dame Darcey Bussell and her colleague, Giselle Parker, who is the CEO of Darcey’s dance fitness programme for schools. DDMIX or Diverse Dance Mix. I got on with all of them really well and we all bonded as we delivered workshops in a venue heaving with noise, people, music and technology glitches. back in its box while I did other events. 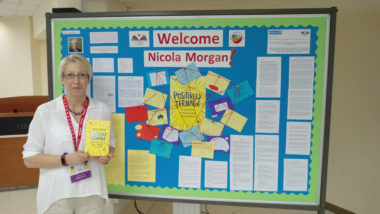 The school event was at the Horizon International School, which made me so welcome and had created a display of incredibly relevant and touching work. There were two stand-out highs of the Litfest for me. One was the School Librarian of the Year Award. This was such a celebration. 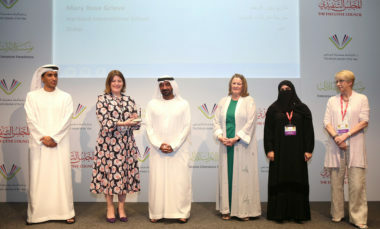 A well-known Emirati children’s author, Maitha Al Khayat, and I did a short panel event with Yvette Judge, the chair of the judges (great name for a judge!) and then the ruler of Dubai came on stage to present the prizes. It was, I gathered, a huge honour for everyone that he’s chosen to come to this and marks the government’s commitment to reading and literature. Here’s something interesting. I’d noticed that the hand-shaking formalities between genders were different depending on whether the participants were Muslim or non-Muslim. So, all women shook hands with all women; all men shook hands with all men; all men shook hands with non-Muslim women; but Muslim men and Muslim women didn’t, as far as I could see, shake hands. Later, I asked Maitha about this. She explained that it depended on whether the woman wanted to shake hands with the man. If she did, she put her hand out; if she didn’t, she didn’t and the man would not be allowed to offer his hand. That was not what I thought I was seeing. Shows how we make assumptions, doesn’t it? The next high was my event in the public programme about Life Online – screens, smartphones and social media. Fantastic audience and great mix of teenagers and adults. Probably the most lovely audience I’ve ever had, if judged by the nodding, engaged faces and the wonderful questions from young people. One stand-out question came from, as it turned out, a 16yo girl: “You’ve talked about the problems of over-use of screens by adults and teenagers but what about when parents of young children like 5yos are on their screens instead of talking to their children? What effect do you think this is having?” Cue huge applause from me and the whole audience. My answer, in a nutshell: I completely agree that this is a problem and sad and worrying to watch but I’d change one thing about the question: it’s not just parents of five year olds but parents of babies from the day they’re born. Babies learn language from adults engaging with them, chattering to them, having both verbal and non-verbal communication. No adult-to-baby chat is wasted, with everything helping to build the skills needed to do that incredibly complex thing: human speech. Importantly, language is one of the few skills that has a “window of opportunity” of the first few years of life. If a child misses these opportunities it’s difficult or impossible fully to make them up later. Miss the chance to learn to play the xylophone and you can learn it just as well later; miss the chance to learn to speak (and hear) your first language and you can’t learn it just as well later. If parents of babies and young children spend time looking at their phones instead of their children’s eyes, they risk serious negative consequences. So, yes, that 16 year old young woman was right to criticise parents who do that. But we should all look at our behaviours with our screens, those screens that fire our brain’s reward systems with endless doses of tempting, rewarding, delicious, addictive dopamine; those screens that as well as bringing us “social” media can also make us anti-social; screens that, used inappropriately or without thought, alter our conversations, hinder good sleeping habits, and become our tyrants instead of our tools. We need to set good examples and use our wonderful screens well. And as an example of adults not using their screens well, let me offer you the distinct low point(s) of an education conference somewhere not in the UK: a series of talks by various speakers where the adults were constantly on their phones, having full-volume conversations during the sessions, taking selfies of themselves in the audience, getting up mid-talk to take a selfie of themselves with the speaker, playing games (as I realised when I sat at the back of an audience) and generally behaving worse than I’ve seen any teenagers behave with their devices. 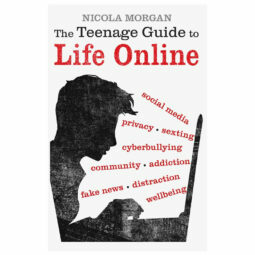 My main point, at my Emirates Litfest event and in The Teenage Guide to Life Online is: this is not about “young people being on their phones all the time”; it’s about people of all ages needing to do a much better job of using our devices and not being used by them. Here’s my pledge. Adapt it to suit yourself but do think about how you can live well online.